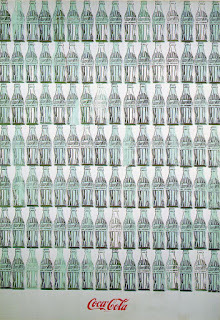 I cannot comprehend how the Pop Art-ist Andy Warhol ate the same lunch for twenty years – like Albert Einstein, or Alfred Hitchcock, who always wore the same clothes, I can only guess a standard lunch of condensed soup (usually tomato) and Coca-Cola means you save precious seconds that can be spent thinking how to produce the perfect screen print of Marilyn Monroe, or of an electric chair, or something. Having just eaten this lunch before writing – I had cream of mushroom – I feel that fewer than three hundred calories does not feel like enough to sustain you until dinner, and the soup really needs to be eaten with something. It might fill a hole in your stomach, but not much more. 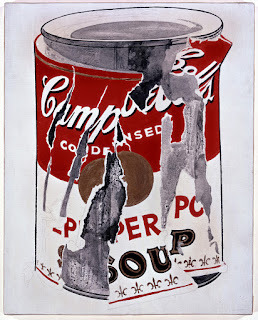 However, this was not why Warhol, whose career as a commercial illustrator for newspaper and magazine advertisements led him into fine art, chose to make his name by painting the cans and bottles that he saw every day. With a chance to submit works to a gallery, and a need for to distinguish his work from more polished artists, like the comic book-style canvasses of Roy Lichtenstein, or British artists like Peter Blake (he of the “Sergeant Pepper” album cover), a friend suggested Warhol should paint a subject already familiar to people. 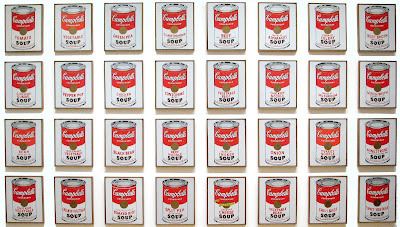 The final work, literally named “Campbell’s Soup Cans” (1962), consisting of thirty-two paintings of every flavour available at the time, including Manhattan clam chowder, caused a sensation, mostly from people not sure what to make of it, or outrage over seemingly too much effort used to paint a picture of such an easily available, manufactured object. Pop Art is based around taking images from popular culture, often changing their context and meaning as a result. The more ironic the use of a banal or kitschy item, the more success the artist may have - the reason a five-year-old can’t do it is because they wouldn’t know why they should. It was a journey not many people had taken, or would want to take, but in our era of unmade beds and sharks in formaldehyde, gallery audiences nowadays are much more receptive. While I see the elevation of mass production into fine art, what I also see how we can rightly take mass production for granted. Without various factories, processes and conveyor belts, consider how much effort it would take to produce a can of condensed soup, and a bottle of cola, from cooking the soup and mixing the drink, through to forming a metal can, blowing a glass bottle, and illustrating the labels. 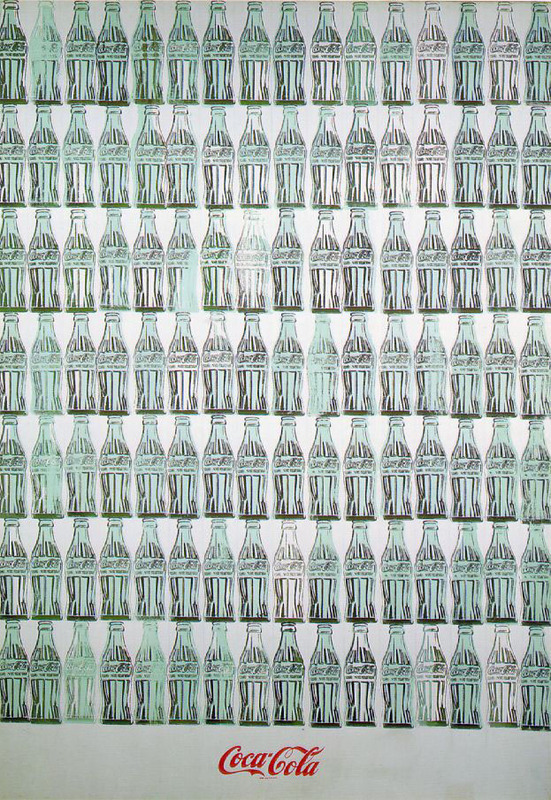 In the book “The Philosophy of Andy Warhol,” whether he wrote it or not, Warhol, an immigrant from what is now Slovakia, stated what made the United States great was how it “started the tradition where the richest consumers buy essentially the same things as the poorest… the more equal something is, the more equal it is.” Whether you spent tens of millions of dollars on his paintings of soup tins and Coke bottles or, in my case, £1.68, the meaning of what you see is the same. Democracy, especially in art, means no special treatment for anyone, and levelling the playing field, however that is done, means someone had to take a big step first. 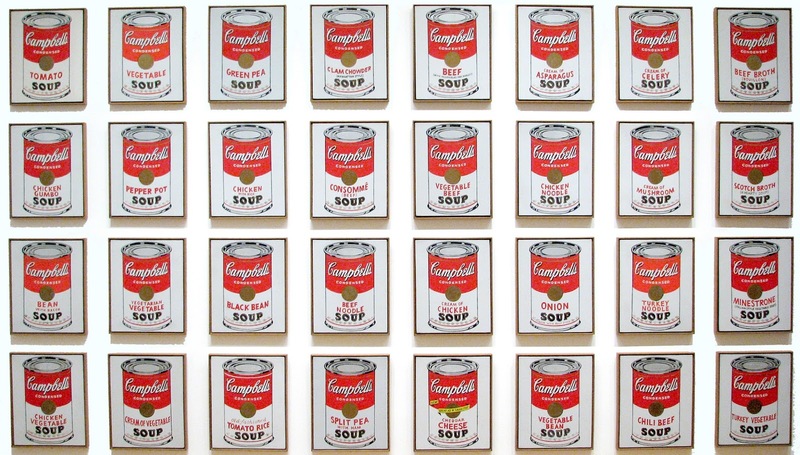 Originally intended to be sold off as individual canvasses, the gallery owner bought all of “Campbell’s Soup Cans,” and they are now kept together by the Museum of Modern Art in New York. 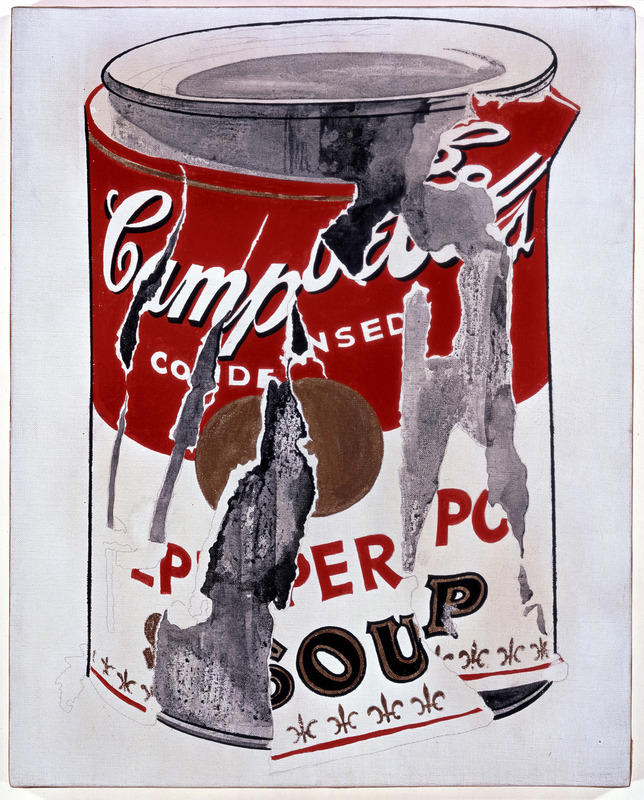 For Andy Warhol, having had his first successful art show, he could concentrate on pictures of what he enjoyed the most – soup, Coca-Cola, money and celebrity.